More than 15 years ago I was in an incident that left me fighting for my life. On three occassions I 'died'. As a result I was left with multiple injuries which has left me disabled. I am a survior. I am an author, I wrote about my experiences in my book- The causeway- the bridge from here to there, a Near Death Experience. Saddness, I have bee surrounded by it for the last few weeks. So much so that I couldn't bring myself to writing on my blogs. It has involved the tragic passing of some very young men. Son's of friends of mine...son's that were the same age as my own sons. Tear have flowed, we are emotionally drained but life must go on. Faith and belief comes us together. That is such sad news Jo as it is when anyone dies but I think more so when the person is young. Sorry to hear of your sad time.Hug and rainbows for you. Hi Jo. I've come back to your blog very late (story of my life!). Dear Jo, we need you. Don't let us down now! We are made to bear our grief. How else could we ever go on? There are those here that listen to you and . . . in the only way we can . . . love you. Please come back and let us ease your suffering. More than 15 years ago I was in an incident that left me fighting for my life. I 'died' three times. I had a Near Death Experience. 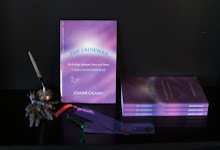 I am the author of the book "The Causeway, the bridge from here to there, a Near Death Experience". I love life.